You no longer need a message pad or a separate phone messaging program. When you receive a call for another employee, you can quickly check their availability using the board, and then move right to the Message Pad – saving time and eliminating the chance of lost message slips. Click on any user on the Out’n About! for Outlook In/Out Board and select ‘WYWO Message…’ from the user menu. Out’n About! 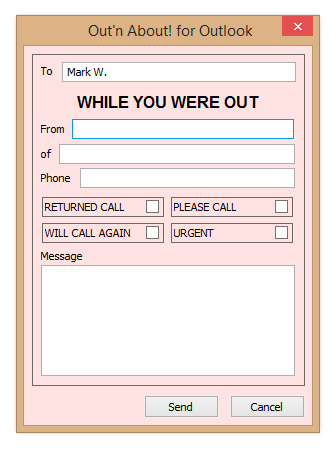 for Outlook will display the WYWO Message Pad. Enter the message details and hit the ‘Send’ button.